This monograph brings to light the eschatological patterns and procedural constructs of death rites in ancient Tibet. It is centered on documents written between circa 800 CE and 1100 CE, which include an illuminated funerary manuscript of much rarity, two death ritual texts recently recovered in southern Tibet from the Gathang Bumpa religious monument, and several related manuscripts discovered in the Dunhuang grottoes a century ago. This book builds upon previous efforts of the author to explicate the otherworldly dimension in early Tibetan religion and culture. Many of the documents of this study were written in the Old Tibetan language and represent the oldest known literary sources for research into Tibetan funerary traditions. The work is underpinned by annotated translations, which are critically edited and painstakingly provided with Classical Tibetan word equivalents. Each featured text is described in detail and subjected to a rigorous religious and historical analysis. Other Tibetan literature that supports the comprehension of the foundational texts of this study is also marshaled. These textual assets complement one another by progressively revealing an indigenous belief system and praxis of great depth and intricacy. 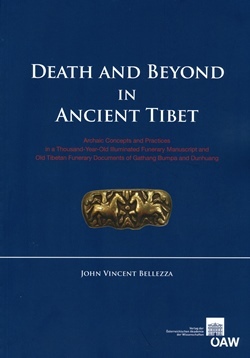 The antiquated narrations and rituals concerning death presented in this book furnish a lucid view of cultural forms that circulated around Tibet before its religious universe became saturated with Buddhism and Buddhist-influenced doctrines and practices. Especially when seen through the lens of the archaeological record, the sheer intellectual and material wealth borne in the archaic funerary traditions demonstrates that Tibet was endowed with culturally advanced societies in the time before the spread of Lamaism. Bibliographies and indexes (with glossary) are appended to the main text.